On Oct. 11, the Cook County Board of Commissioners voted to repeal the notorious sweetened beverage tax. Fifteen of the 17 commissioners voted in favor of the repeal, providing enough support to thwart a possible veto of the ordinance. Shoppers will no longer have to pay the penny-per-ounce tax starting Dec. 1. For months, commissioners have been subject to relentless criticism from taxpayers who overwhelmingly disapprove of the so-called “soda” tax. It appears that this tax was the tipping point for residents who have had to shoulder of one of the highest tax burdens in the country. From the nation’s highest wireless taxes to taxes on streaming services such as Netflix and Spotify – not to mention a record-breaking property tax increase and the highest sales taxes of any major city in the nation – residents of Chicago and Cook County at large are tapped out. They have made their voices heard. Shortly after its implementation, one poll commissioned by the Illinois Manufacturers’ Association found nearly 87 percent of Cook County residents disapproved of the tax, and in the same poll 80 percent said they believed the tax was being done strictly for money and not for public health. 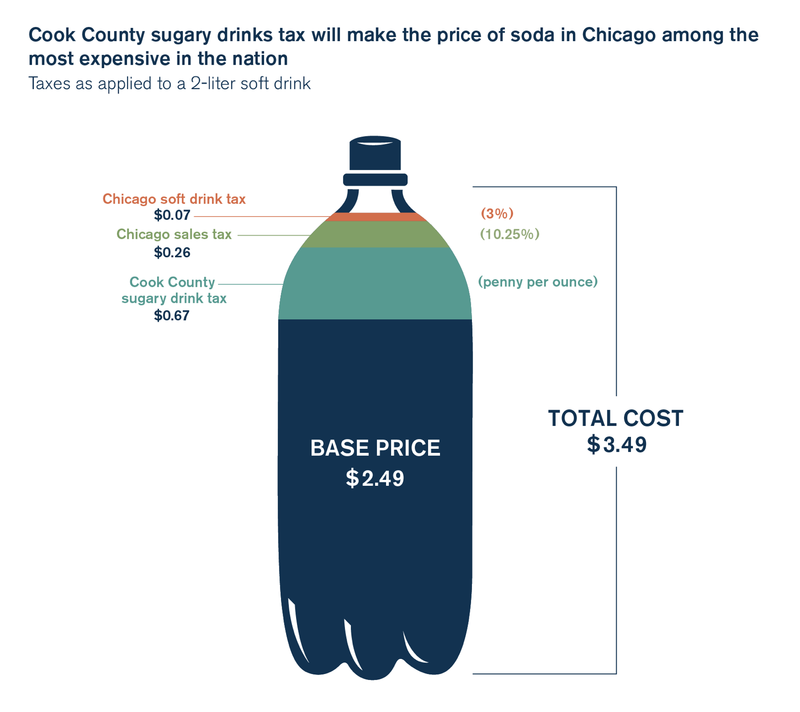 Cook County Board President Toni Preckwinkle later admited that the county’s sweetened beverage tax was always about increasing revenue. Taxpayer anger has extended beyond the soda tax debate. Constituents are expressing their displeasure with politicians who enacted and supported the tax by reportedly refusing to sign circulating petitions to simply place incumbents on the ballot in 2018, according to Crain’s Chicago Business. The fight does not end here, however. As state and local governments in Illinois face continuing budget crises, elected officials will try to hit up tapped-out taxpayers rather than tackle needed reforms. In fact, Cook County is one particularly good example of this. Thankfully, taxpayers fought back to stop their efforts. And now they should fight for the change needed to truly fix spending problems within their local governments. Chicago-area politicians should look to enact meaningful reforms such as introducing a 401(k)-style alternative to failing pension funds, addressing local spending and eliminating tax increment financing districts. Taxpayers should keep up the pressure on elected officials to adopt these reforms. Otherwise, residents will continue to live under the constant threat of increased taxes and fees.